I love comfort! Especially in my shoes since I live life on my feet everyday. I decided to marry this company in 2009 when I humored myself with buying a pair of the most unimpressive looking insoles I had ever seen from a vendor neighbor I was working next to at a trade show. I thought I would just do him a favor by patronizing his business but I quickly realized that he had actually done me a favor. I was seeking something that would alleviate my sore feet and my achy lower back to help me through the long 12 hour show days. These ultra-thin things were amazing! I had plenty of experience with different insoles from the time I was a child. I have hereditarily inherited low arches so orthotic arch supports were custom-fitted for gymnastic shoes by the time I was in elementary school. These massaging insoles were very different. They were not the structural support I was used to, nor were they the simple drug store cushions of which I had bought so many and thrown away. I decided these were like magic. They were so thin I could put them over my orthotic arch supports so I could have structural support as well as circulatory support. AND, they could fit in shoes my orthotics couldn't fit into! Like heels, dress shoes, ballroom dance shoes etc. Around this time when I was introduced to these wonders, I was looking for a business opportunity and realized this was exactly what I was looking for- something I believed in, something that was healthy, something made in the USA, something which helped people, and something that would bring happy customers back to me because they wanted their family and friends to experience the same. 9 years later I am still enjoying these insoles in all my activities from working out, dancing, skiing, golf and just kickin' around in cowboy boots, heels, flats etc. I take this message of comfort to trade shows, health and wellness fairs, coaches clinics, and safety meetings, to name a few. In the process I have had the blessing of hearing about various testimonials from people who have a multitude of reasons for which they seek a different type of insole. These ranged from those just looking to add comfort and energy to their long, physically demanding work days on their feet to others who dealt with different degrees of pain- plantar fasciitis, diabetic neuropathy, arthritis, sciatica, heel spurs, knee, hip, and lower back issues and even other conditions of which I had never heard of before and was told these had helped bring relief. My customers became soldiers, police officers, nurses, athletes, construction workers, hair dressers, business folks, city workers, warehouse crews, dancers, and the list goes on. 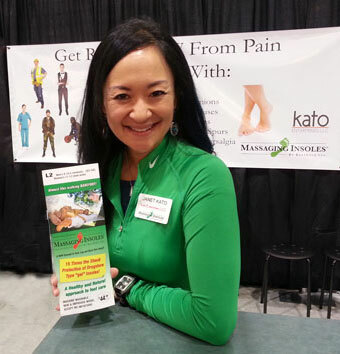 Others who looked for a quality pain relief shoe insole were those who were looking on behalf of their patients, clients, and customers. These were chiropractors, massage therapists, acupuncturists, pharmacies, labor industry supply stores and more. For the majority of the time I only carried the Massaging Insoles since this is the star product. I have only recently begun to carry other items as I find them also personally beneficial. Happily, as I have added these products, I found that other customers also have enjoyed their efficacy. My realization is that there is no one product that works the same way for every single person, nor are the insoles made to cure people of ailments. But just as these insoles did wonders in adding about 5-6 hours of non-medicated extra comfort and pain relief to my day, my hope is that everyone finds the same type of "Hooray" that I did and becomes one of my many repeat customers who desire to spread good health to their loved ones as well!